L'accueil est ouvert 7j/7 de 8h30-20h30. 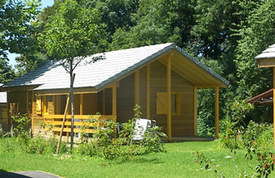 >> Booking option chalet : cliquez ici. 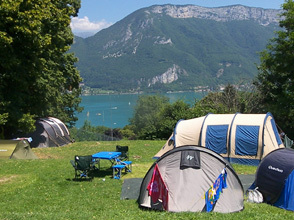 At the foot of the Semnoz mountain, on the edge of a forest and overlooking the lake, the “Belvédère" municipal campsite is in a perfect location. Starting point for hikes or mountain-bike circuits, you are 10 minutes on foot from the old town, the port, the beach and the swimming-pool. In a wooded area covering 3 hectares, the campsite offers 117 places, all equipped with electricity (10 A), 75 with water flow and disposal points. You can choose to stay in one of the comfortable fully-equipped chalets (capacity : 7 people). 3 leisure rooms, children’s games available. Various services are also on offer such as laundry and grocery. 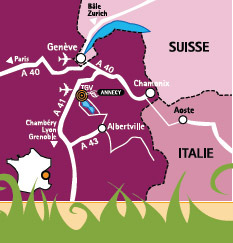 The campsite is served by city buses (in July and August).